A few pictures from our last few weeks. The first day after surgery #1. Playing with her toys about 4 days post-op surgery 2. Her official 14 week picture, in her new monkey hat. She's too cute! Glad she is recovering well. I pray for her every night. Wow, she really didn't look like herself at all after the first surgery, you guys weren't kidding! She looks great now & I'm sooo happy you all are home!!! How wonderful for the whole family! I continue to pray for all of you every day! Congrats! OMG she is so cute....how precious!! One of, if not THE most beautiful little girl I have ever seen! What an angel you have! God Bless all of you!! So beautiful! What an amazingly strong little girl. Adorable! How heartbreaking it must have been to see that poor, swollen baby after her surgeries... But she looks to have bounced right back! I hope she enjoys being back home and sits around putting on lots of weight for you guys! Simply precious!!! So thankful she is home!!! Praising God for that strong little girl!! She is absolutely gorgeous! I'm glad you all are at home now! Many thoughts, prayers, and hugs! She's amazing and so beautiful. I'm so happy to hear that she's home with you now. We're thinking of you every day. I admire your courage through all of this! I would have been terrified had I been in your situation, especially after the surgeries. She looks much better now, and I hope her progress continues! I still can't get over the strength you guys have as a family! She's changed so much. She no longer looks so tiny as she did. She's certainly looking more alert and well-fed! Wow! She's grown a lot. Can't wait to see you guy again maybe on Sunday??? She really is one amazing and inspirational baby. I've been following your blog since thus all started, and am so happy for you guys! She is beautiful, and you guys are blessed with a fighter. I will continue to pray for her, and all of you. Soo happy to hear that Miss Scarlett is back home. Nothing better than that. 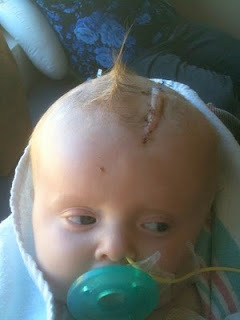 Our sob had a Neurosurgery when he was 6 months old, bilateral incisions and now he's hair has grow covering those scars. She'll be just fine. Try to rest and enjoy your baby @ home. She is beautiful! I LOVE that monkey hat! that monkey hat is TO DIE FOR!! adorable! Gorgeous! I love her hats - they are all so cute. Brandi and Chris - you guys are absolutely amazing parents. I dont know how you managed to make it through all of this. She is adorable, even with all the tubes and bandages :) You truly have been blessed with an angel. Such a beautiful girl...that first picture is heartbreaking. I love that monkey hat - she looks precious. Thinking about your beautiful daughter and your family in Houston. So happy for you guys. I found your blog on thebump.com from one of the Bumpies and read a few of your posts here about your journey. I want to read everything you've posted sometime because your story is amazing just from what I've read. You guys are strong parents to go through this. Congrats on having precious Scarlett home! What a beauty! She is so adorable & the hats are awesome! You 2 are amazing & I am so happy for you all as you continue to fight along side your little girl. Beautiful as ever! Way to go Scarlett. You know, Scarlett O'Hara didn't take no for an answer either- she fought and fought and fought, as God as her witness she fought on. Fight on girl! We have that same Wubbanub paci :) My husband calls it "giraffe-cow" because it doesn't rrally have a long neck like a giraffe, so its spots make it look like a cow! So glad to see updated pictures! Just as beautiful as ever!!! So glad your lil butterfly is home with you all now...what a perfect time to catch up on all the snuggling you have been missing!! Glad to hear she is doing better : ) GOD BLESS YOU ALL!!! Thoughts and Prayers as always!! She looks awesome! Go baby Scarlett!! Still praying as always! She is so cute. I positively love the monkey hat. what a beauty!!!! it looks like she is waving in the picture with the pink ruffly hat!!! OMG I LOVE her! I've followed her/ your story. You are a truly an amazing family. I wish nothing for the best to come and a great future for your beautiful little girl! She's a miracle! Take care! Wow, she WAS swollen! She is beautiful and looks so great! She certainly is a strong little girl. Every time I come to your blog I cry. But now, it is tears of joy. You dont know how much it means to me that she is doing well. I love this little girl as if she was family. She is a beautiful and truly amazing little girl! Seeing pictures of your little fighter just bring tears to my eyes! She is so beautiful. I'm so glad you are home with your sweet Scarlett! She looks amazing! What an incredible little girl! Hurray for such a wonderful outcome!!!! I just love the hats!!! If I find a cute one I will send it your way! I am so glad you guys are home! It is strange that although she is wearing hats to cover her incision, all I see is her beautiful face! I love the last picture of her with punk rock hair best of all because she reminds me of the cupie dolls my grandmother had when I was a little girl. Scarlett is certainly a strong and beautiful butterfly!!! She is so cute!!! I love the picture of her in the monkey hat because she looks like she wants to box someone. I think she is saying, "come here tumor so I can throat punch you!" I can't believe how big she is getting! So stinking cute! Bless her for being such a trooper! She looks wonderful! What a beautiful little girl. I am so happy for all of you that you are able to enjoy this time at home with your miraculous little girl. She is beautiful! I have been following for a few weeks and it is good to see y'all go home! Praying for the blessings to continue! She is beautiful! And what a fighter!! She is beautiful Brandi and Chris! She just makes my heart skip a beat. She is the most amazing little girl. I am just amazed by your story, your strength as parents and the utter amazement that is your precious baby girl. Enjoy every minute you have at home. You truely deserve it. i love the hats! how sweet. what a strong little fighter. go Scarlett!